Visiting foreign leaders and their ilk often opt for China’s specialties, rather than their home fare. Consequently, the dinner table has become a platform for connecting to ordinary locals. Ye Jun reports. U.S. first lady Michelle Obama’s family made headlines Saturday night when they dined at Da Dong Peking Roast Duck Restaurant. The first lady had booked a seat but didn’t join her mother and daughters at the table. Like all mortals, heads of state, their spouses and other leaders ― and their families ― of course have to eat during their time in China. And many opt to go local to get a true taste of China. 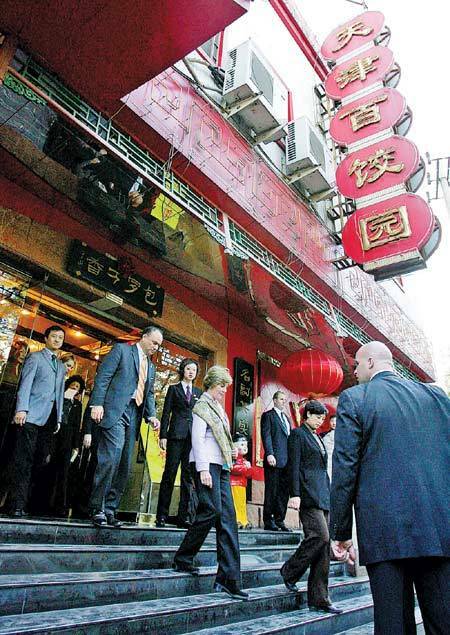 Former first lady Laura Bush, for instance, dined at Tianjin Baijiaoyuan, a specialized jiaozi restaurant in Beijing’s Xidan area on Nov. 20, 2005. Jiaozi, or boiled dumplings, are a typical food in China. They were traditionally eaten as a special treat during Spring Festival, China’s most important celebration. But they’re so frequently consumed now that they’ve become a common meal. Tianjin Baijiaoyuan is a rather affordable diner, offering both jiaozi and popular home-style fried dishes. The eatery earned a Guinness World Record for producing 229 kinds of jiaozi. Bush planned to spend 40 minutes on the meal but stayed in the restaurant for 70. Her entourage tried jiaozi with more than 10 stuffings, including pork with celery, tomato and egg, and mutton with coriander. She told management her favorite was pork with beans. The first lady also ordered fried dishes ― mushrooms with soy-marinated pork ribs, quick-fried chicken with walnuts and bean paste, and tender corn kernels with pine nuts. Bush relished the meal so much that she visited the restaurant again, during the 2008 Beijing Olympic Games. The restaurant’s menu also shows photographs of former U.S. Secretary of State Colin Powell, who visited in 2004. Following Bush’s visit, the restaurant developed a “Mrs. Bush set menu,” attracting throngs of new local customers. Visiting foreign leaders are usually officially received at a state banquet at the Great Hall of the People or treated to a presidential “home dinner” at the Diaoyutai State Guesthouse. State banquets are prepared by some of the country’s best chefs. They need to consider not only food quality but also guests’ religion, ethnicity, eating habits and, sometimes, health. Chefs deliberate ingredients’ health benefits, nutrition and seasonality. Much of the porcelain tableware is specially produced by Jiangxi province’s Jingdezhen, which is celebrated for fine porcelain. State banquets usually feature dishes that represent the best of Chinese cuisine. In October 1986, Deng Xiaoping treated Queen Elizabeth II to “Buddha jumps over the wall” soup. The famous Fujian specialty has more than a century of history and contains up to 20 kinds of seafood and poultry, simmered for hours or days. It’s said former U.S. presidents George Bush and Ronald Reagan loved the soup. 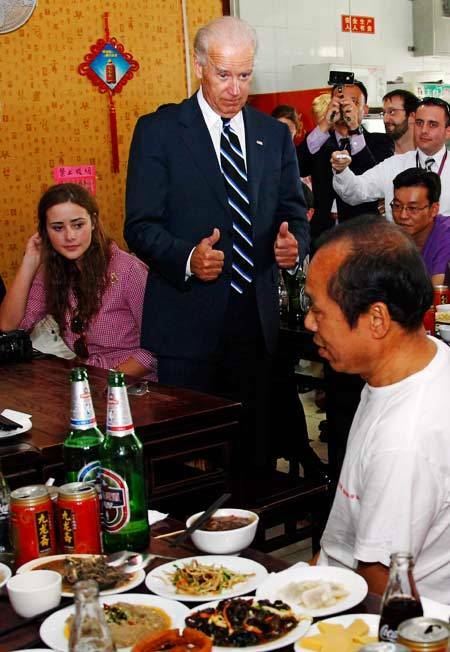 Chinese leaders sometimes introduce their personal favorites at state banquets. Deng is said to have adored cuttlefish-roe soup, a spicy and sour delicacy hailing from traditional Shandong cuisine. As a result, the warming soup became a regular fixture of state banquets. It’s commonplace for visiting leaders to try Peking roast duck, Beijing’s premium culinary icon. Many dine on duck at Quanjude, an eatery dating back to 1864. The walls of Quanjude’s Hepingmen branch have many photos of visiting foreign leaders on the restaurant’s second to fourth floors. Among them are former U.S. President Richard Nixon and his national security adviser Henry Kissinger.